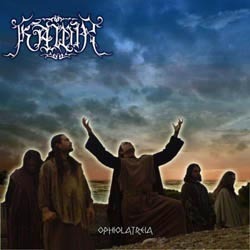 After 2005 comeback with “Arai” Kawir return with their new work “Ophiolatreia” (snake worship). Released in a very beautiful colored digipak, this is their most professional and solid work so far. Nine songs-hymns to ancient Hellenic gods with a duration of almost one hour of excellent Greek pagan black metal. All compositions are big, with very nice melodies and feeling, creating a unique atmosphere, reviving this great lost civilization. I believe they manage to express perfectly their beliefs through their music offering us a very original result, creating a style of their own! About the music now, it’s pagan black metal with faster and slower parts. There are many keyboards accompanying perfectly the guitars, as well as some acoustic guitars and traditional instruments, but in a limited use. The music is raw, yet very melodic and “majestic” with variety in rhythm and intensity. The songwriting is solid, full of new and original ideas, without boring or weaker parts. Overall, I believe it’s their best album so far (if I remove the emotional connection with their debut) and by far one of my personal favorites of 2008! You can get a taste on their Facebook / myspace official profiles.